Since this feature will likely be in development for a while. As of editing other CC lanes, I really miss the old "Edit selected CC, if any - otherwise draw/edit new events", can't remember the exact name. b) My first attempt to edit the CC which correspond to the red C5 note fails, because "New events channel" is set to a wrong one. It doesn't create anything until I switch to the correct channel. Well, happens. I shrug it off, invoke one of Juliasadder's cool scripts that works wonders for this usecase, and go on. c) When I edit the greenish C2 note's CC, I drag behind the area of the note, to show that there won't be any events created after the note-off, and the CC which belong to the next note on the same channel are not changed. a) The CC get selected alright, but visibility is lots worse. No sign of selected CC and "new events channel" stepping to the foreground. It all smears to a hazy soup. b) First I redid the same channel mishap as in the 5.97 example trying to edit the red note's CC events. But now Reaper will instantly create events - which happen to be on the same channel as the yellow C6 at the top and thus change its existing CC curve. I need to undo, so I swear a little. I prefer the old behavior. c) Editing the greenish note demonstrates how Reaper will now start creating CC out of bounds of the note, and what's worse, also change the existing CC curve of the next note on that same channel. Some very good points here. The main thing these comments illustrate is that there will need to be different editing behaviors between track envelopes and CC-data-as-envelopes, even if they look similar. Yes, please restore old behavior as a new mouse modifier! And yes, consistency is good, so having the same modifier for track envelopes would be excellent. Remember Steve Ballmer? His thing was DEVELOPERS DEVELOPERS DEVELOPERS DEVELOPERS. DAWs (and most programs) should in fact be CONSISTENCY CONSISTENCY CONSISTENCY CONSISTENCY! So how will we deal with single events? With regular envelopes it takes 2 points to make a sudden single change. I prefer the new behavior with in line CC editing. It is far easier to draw a curve than adusting several CC bars. Can we have both? Bars are nicer for certain things, and cleaner to draw if you have a very square response in mind. Square shape works just like old bars. I think schwa said no, but I'm with you, it would be great if we could have both. 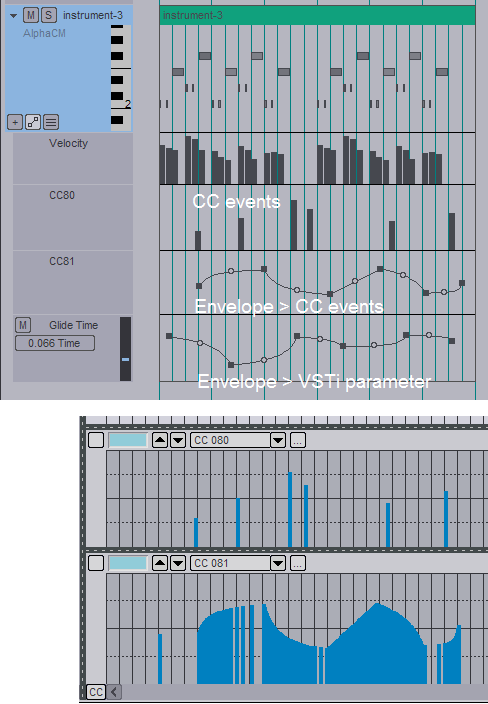 (c) VST parameter envelopes (see the Glide Time lane). (c) maps the envelope values to the specified plug-in-parameter. The bottom two lanes in the screenshot show the CC messages sent by (a) and (b) respectively. Regarding the switching of CC modes, it is necessary that this is done individually for each CC line. Otherwise, the linear mode is not suitable for the 64 CC controller (for example). Otherwise, the linear mode is not suitable for the 64 CC controller (for example). In Logic you can have both : CC lines in midi editor ,bars in Hyper editor. Perhaps the solution is to add another editor in reaper ? Ok I understand it is too hard but in Logic you can see all the events in parallel in the hyper editor. Last edited by dupont; 03-13-2019 at 01:22 AM. Nope, this is redundant, but showing the number values would be exttremely useful. (Both for CC/velocity lanes as for true envelopes). In my opinion the bars in general aren't very nice way to represent midi CC-data. The new lollipop style with clear handle and indication of instantaneous value is very very good compared to the old bar style. CC is just an instantaneous value, it doesn't have length in time, thus when the bars (they had width) were close together, they started to overlap and that made them a bit cumbersome to use. Especially if I had chords, the different velocities were overlapping and it was a bit of a nightmare to see where those overlapping velocities were to grab the right one to edit. Or if I had multiple channels visible at once etc. I like to clearly see the area of the event handle where by I can grab the event to edit it. The bars have never been very intuitive in that regard. That being said, I wouldn't enjoy editing CC-64 for example as a square envelope (I play a lot of piano) but lollipop graph would be very nice and intuitive. If you then go and edit a single event after drawing that envelope, REAPER could just create a "step" in that envelope that would correspond to the singular event that doesn't for example follow that linear ramp you just drew at the envelope view. And vice versa, if you draw e.g a linear envelope on top of existing events, then they would get overdrawn with new ones according to that envelope etc. The one that was last touched/done would dominate. And yes, consistency is good, so having the same modifier for track envelopes would be excellent. this is why i get confused when left click in cc/velocity lane doesn't move the edit cursor. is there a reason for this difference in behavior that i have overlooked? I think we also need a new representation of curves in the arrangement (items). Both items show a ramp down at the end of the item. One consists of 2 points and the other one of multiple points. In the case of the first, the curve itself is not conceivable. But that totally depends on what your doing. I have nothing against the envelopes, but there are definitely times when the simple event is very beneficial. It's quite obvious there are many Reaper midi users, but I think it's also safe to say many, if not all of us, have our own needs and ways of doing things. I've been using midi since the mid 80s, and CC editing has always been using CC events. I have to admit though that my main experience has been with Cakewalk and Reaper. I do understand the desire for envelopes, most folks today are used to them. But they are not necessarily the panacea for midi. Sorry, that's my take on it. If they are set to square, they basically are no different. They are still distinct events, just as our old bars were. The handling of them needs to get back on par with what we had before though, or anyone dealing with recorded CC (or just preferring the ordinary "many-events approach" generally) will suffer. Apart from modifiers not working as expected (yet) it's at the moment harder to select single events than before. And if several channels are existing on the same lane at the same time it's visually not as good as it could be. The active channel needs to be up front. At the moment they seem to be drawn in reversed channel order (lowest channel at front), or something like that and the fill colors seem to get mixed where they overlap. Muted events are in no way indicated as of yet, too. I think that's all stuff that can be solved. As long as old style editing doesn't suffer, I think both CC and automation editing can benefit from this development. Thanks gofer, so first of all how are single events placed? Right now we just double click to add a CC event. Secondly, will our custom actions for CCs still work? I've got hundreds of custom actions and scripts that handle single CC events. Also, sorry if I missed this somewhere, but what about velocties, Will they be displayed with envelopes too? On the other hand it would be really cool to have a time based quantization feature. So when you draw an LFO like CC envelope the output to your hardware gets limited to a practical value so it's secured that those important note events don't come two seconds later. Option for PPQ of interpolated events does exist in dev0312a. Ha ha, well I thought so too, but who knows these days, so I asked? So what about current custom actions? No, because that makes no sense, velocities are not transitional events, they are one-time thing that happens at beginning of the note. No DAW that I know uses curves for velocities, and it should stay that way. - The curve tool is nice. I wonder if it only has one type of ramp? Would be excellent to be able to edit the curve itself using the mouse wheel. The tool-based paradigm is fortunately not a thing in Reaper, so it would have to be initiated differently. - It looks like they only approximate curves using linear interpolation. This makes it a hassle to edit the curve afterwards (which is also a problem in the old way, using bars). Thanks Mordi, maybe I missed it but how do you create sing events. I assume you mean single events? 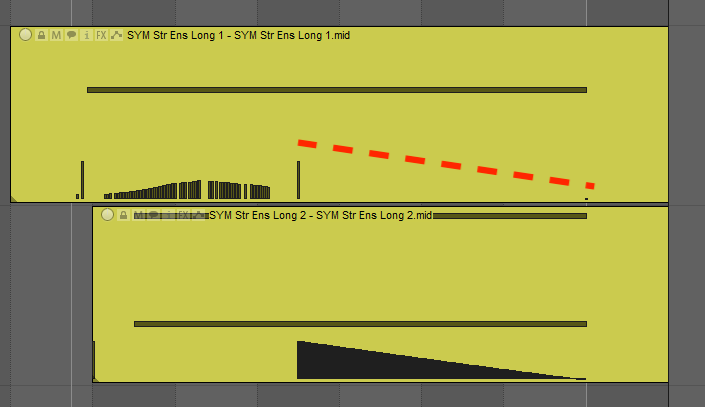 I just tested, and it looks like inserting a single event will create a line through the whole MIDI item. Thanks again Mordi and yes, I understand about adding points. What I'm getting at is adding single events that are at different levels. I've got a lot of Kontakt programs where I use single CC events. I'm envisioning some kind of modifier that creates 2 points, one that keeps the current level and the other sets the desired level. Heh heh, and this also brings up the question of what happens with CC64 Sustain? And I'm also concerned that our current custom CC actions will still work? Is this a stupid question? Why can't MIDI CC editing in the MIDI editor work like MIDI CC editing in the track envelope area? It seems to me a lot of the work converting a curve to discrete MIDI CC values has already been done. this x 1billion. In the Track Envelope Area (with ReaControlMIDI) you have the added benefit of Automation Items. The disconnect seems weird to me. Having Automation items in the cc area would be great because you can save the shape as a preset and use it to other Automations items. However i would prefer if few things were added that would make them much more powerful for the arrangement or cc area. With this way we could use the parameters such as Phase,Amp skew,Cycles,Freq skew for any shape! 2) Also when we load our preset,the shape should be at the same length with the AI. Right now if i save a shape from an AI that has length 16th,if i draw another AI with a bar length and load the shape from the AI that had 16th length, it divides and loops the AI 4 times so four times our shape instead of one at a bar length. 3) It would be very flexible to draw shapes just like Studio one or Cubase examples, if we had a click n drag mouse modifier that could paint-duplicate Automation Items depending on grid. Edit: Or instead of the 3rd option,it would be great if we had a menu with shapes to paint them inside Automation items just like this example. Last edited by Vagelis; 03-15-2019 at 06:21 AM. Because obviously the code handling those two different areas is probably largely different and cannot be easily transplanted from one place to the other, perhaps? Automation item with MIDI CC would be amazing. MIDI CC displayed on arrangement windows, too. And arrangement automation envelope displayed inside the midi editor, too. It's the futur. One important point to say out loud, though: people working with something like orchestral libraries, recording articulation/expression data as CCs for individual intrument lines and performances, are some of those users that absolutely need this CC stuff inside the MIDI editor, and that's the absolutely necessary place where it has to be editable (as it is now). It's so integral to the process of working with performances like that. As in, having all MIDI (including the CCs) in the same editor and being able to keep them tightly connected, on the note level, is extremely important: often when you move a note, you want the associated CC gestures to follow (and of course preferrably be graphically represented in the same editor), so that you don't change the actual expression of the note you are moving, and can tweak that CC as a part of that same process as you go. Being able to see the CC on the track lanes as the only option would create a serious disconnect for such composer workflows. Last edited by Lunar Ladder; 03-15-2019 at 06:52 AM. If we have Automation items in CC they could be displayed on arrangement window with midi inline editor propably which would be amazing. I've seen people commenting (in some other thread somewhere) that smooth curves don't make sense for discrete MIDI CC values, yet there is already code dealing with the conversion of curve data into discrete MIDI data within Reaper already. That code, not the curve drawing code, should be reusable if it was written in a modular way. I'm assuming there is some reusable analog to digital function that takes care of it. Until then, I'm making good use of the MIDI CC curve drawing code from juliansader. I would happily use the MIDI CC lanes in the Track Envelope Area if I could get recorded MIDI CC curves to stop fighting with the live position of my MOD wheel when I'm not even actively recording (play head isn't moving). I've tried a couple plugins that are supposed to help with that problem but have not been able to get it to work right. Within the MIDI editor, if I've previously recorded some notes and some MIDI CC in the MIDI item I'm editing I can still move the MOD wheel and the live MOD wheel value gets used so I can continue to play my MIDI controller and experiment with the section of the music I'm working on. In the Track Envelope Area, there is a battle between the recorded MIDI CC values and the live MOD wheel setting and the recorded MIDI CC values always win. If that were fixed, I'd be using the Track Envelope Area for all MIDI CC recording and editing.